I wake up early enough to shave (if I’m gonna be on TV, I probably should shave) and finally figure out how how easy it is to get to the Bear Tooth. Taavi is there and we talk about what he should see and do while he’s in Anchorage. The TV crew shows up and interviews all the Snowdance filmmakers — including the Beekeeper guys (who again arrive in a pack). While I’m there, they do a projection check of my movie and I’m thrilled to see how good it looks on the big screen. I get back to the theater about 45 minutes before the screening and I’m thrilled to see a huge number of people already lined up to get in. I do a quick interview with Robert Forto from Dog Works Radio in the lobby; he’s moved up to Willow from Colorado to train for a 2013 Iditarod run. I’m impressed by his digital audio recorder, which resembles an old-time radio microphone. The movie starts and I’m sitting in the back with my friend Jaime. Sue Allen, Mike Suprenant, Larry Williams, and John “The Poodleman” Suter (mushers I interviewed for the movie) are all here. Mary & Janetta (who used to run the B&B where my wife and I stayed the first time we came to Alaska) are here too — although I don’t get a chance to really talk to them. I’ve seen the movie so often I think I might know it all by heart and as it unfolds I’m bombarded with memories of filming the scenes and the months of postproduction on the movie. It looks good on the big screen and I’m relieved to hear people laughing at (most) of the things I thought they would laugh at. (It’s also interesting that a few things get much bigger laughs from Alaskans than I expected.) More importantly, everyone is completely engaged and caught up in the movie. I’ve got too much nervous energy to sit still, so I find myself wandering in the back of the theater, lurking for on different sides, scanning the audience and watching them watch the movie. It’s over quickly and I go up (along with the Nikolai filmmakers) for a Q&A. The audience seems totally engaged and really into it. People come up to me afterwards and in the lobby and I feel like a rock star (even if it’s just temporary). More than one person tells me it’s hard to believe a non-Alaskan made a movie that captured the spirit of Alaska so well (which is just about the highest praise I could ask for). I have dinner with my friend Jeanne Devon from the Mudflats blog and we indulge in pumpkin pie martinis. I’m completely exhausted but totally wired and happy. The feeling of seeing something that for years has only existed in my mind become a tangible thing that other people can experience is completely wonderful. The rest of the trip is a blur: the next day I wander back downtown, stop and say hi to my new Facebook friend Star, have breakfast at the Snow City Cafe, walk back to the sled dog statue on 4th Avenue (that marks the start of the Iditarod), pop into a Starbucks to check email and run into Larry Williams (an ex-musher who’s in the movie; he and John Suter are developing a movie based partially on Suter’s experience running the Iditarod with a team of Standard Poodles) — we have a great talk, then I’m off to meet Peter Dunlap-Shohl (who directed the fantastic animated short Oblivion 1964) for coffee, chat with several filmmakers who just got into town, have a great conversation with director Erik Knudsen (not to be confused with SAW actor Erik Knudsen; I’m sorry I missed Erik’s workshop “Cinema of Poverty: Independence and Simplicity in an Age of Abundance and Complexity” and his interesting movie “The Silent Accomplice,” which follows water on its journey from a spring out to the sea”), watch Stephen Greenberg’s do “A Life Ascending” (the story of a mountaineering guide in the mountains of British Columbia), then head over to Out North for a sold-out screening of Journey on the Wild Coast, about a married couple who hiked, kayaked, and skied 4000 miles from Seattle to the Aleutian Islands. I had talked before with Journey director Greg Chaney, who sifted through hundreds of hours of footage shot by the couple to make the movie (for details, click here). Volunteer coordinator (and all-around amazing person) Beth managed to snag me an AIFF t-shirt from a previous year that I admired — and she squeezes me into the packed theater so I can see the movie. More than one person I’ve met has said that Beth should be a line producer (or maybe a fixer in some war-torn country) because of her amazing ability to get the impossible done almost immediately. From there, it’s back to the airport — where the TSA agents run my back through the X-Ray machine three times and gather around to stare at it. I realize they’re looking at some of the film festival Swag — a pair of handcuffs promoting a film that AIFF distributed to all visiting filmmakers. I start to say something, but the TSA agents just smirk, raise their eyebrows, and let me through. My overnight flight from Anchorage to Seattle is fairly empty, so I get an entire row to myself and sleep most of the way. I’ve got a 5-hour layover at SeaTac, which I spend working (thanks, free wifi) before I catch my flight back to LA (I sleep through most of that one, too). I wake up just before we land, watching the sun shine brightly off the sandy beaches. Thanks for an amazing weekend, Anchorage! Wonderful review of your adventure. 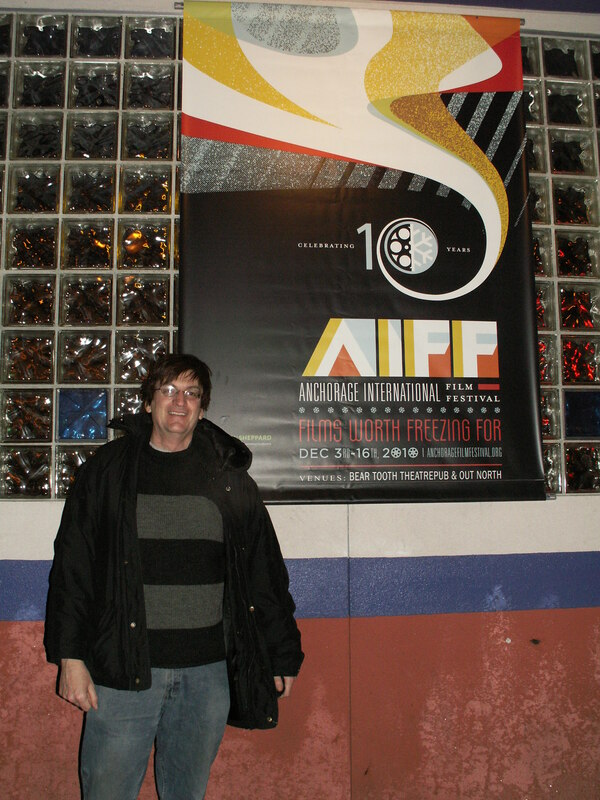 Alex it was great to meet you at AIFF this year. I really enjoyed “M*U*S*H” and I am very curious to see how it is received outside Alaska. Too bad we didn’t have more time to hang out. Let me know if you are interested in showing “M*U*S*H” in Juneau. I really enjoyed reading this and would love to see the film. I wrote you a while back about Dogsledding and you recommended some books to me. They are great. I haven’t finished my novel yet (not even close). Had some other stuff and health issues get in the way, but it’s still my goal to git er done this year. Have you got a Facebook page? There’s just too many Alex Steins out there to go through every one of them. But I’d like to follow what you are doing.